More and more I'm searching out outline stamps for my collection. You can use them by themselves, color in the images or stamp them on designer paper and cut out. You can also stamp another image on cardstock, stamp the line art stamp on the cardstock and then cut the design out. 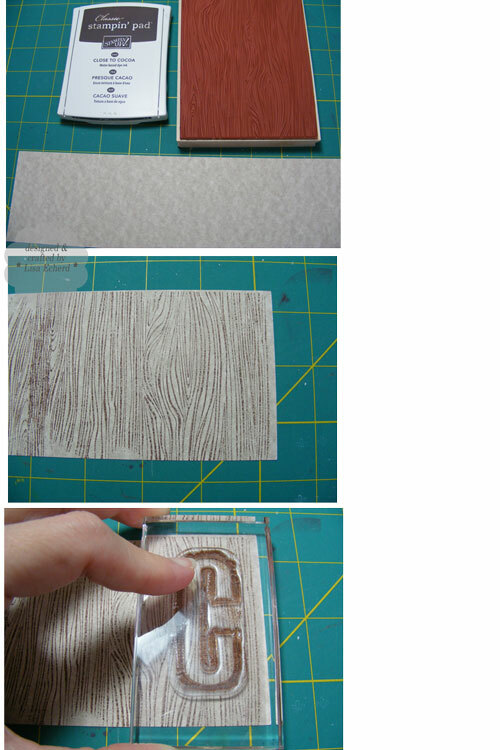 This is how I got the woodgrain "CABIN" in this layout. 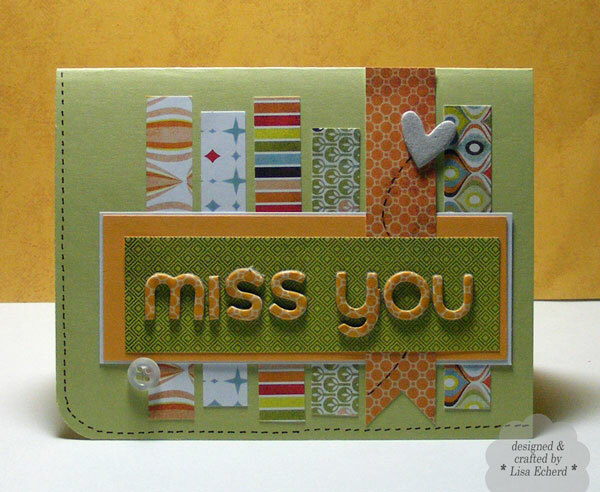 Stamp cardstock with background image. I used Hero Arts woodgrain stamp and Close to Cocoa ink. Then stamp over the background design with an outline stamp in a similar or contrasting color. I used Chocolate Chip ink. Then just cut out the image. I left these kind of rough cut as that is part of the letter stamps - an alphabet stamp from Katie Pertiet for Autumn Leaves. 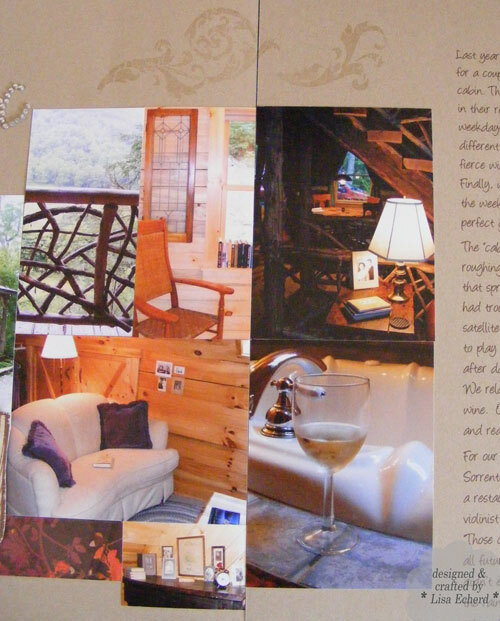 This layout commemorates our anniversary stay at a cabin in the NC Mountains near Valle Crucis which means Vale of the Cross. It is about 15 minutes north of Boone, NC. I have another layout planned for our hiking experiences but wanted to capture the lovely place we spent our anniversary this year. 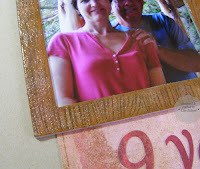 The woodgrain background stamp was used again on this photo frame. 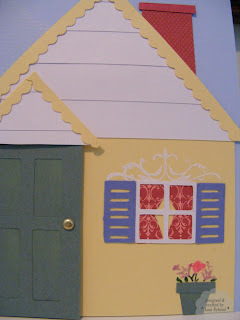 I started with a square chipboard element from Stampin' Up! and inked it with several colors of craft ink from Earth Elements. Then I stamped the woodgrain in Soft Suede. Then I went over the entire thing with Versamark and coated with clear embossing powder. 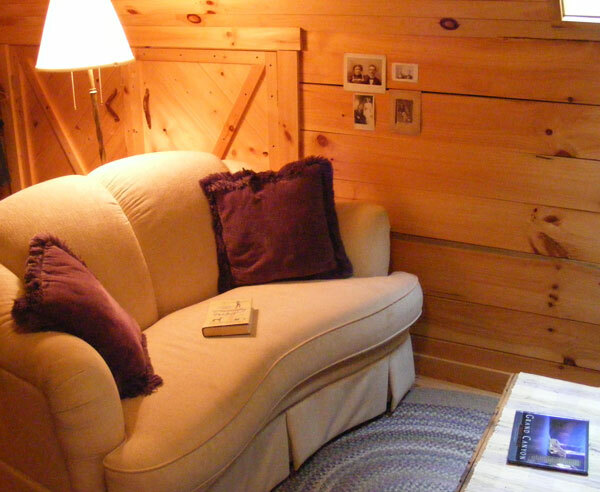 After heating, I got a stained wood look that matched the interior of the cabin. We did the versamark trick on chipboard in our last Stamp club and we got really neat effects depending on the ink used. Jean, our demo, suggested going over an item with two coats of Versamark and embossing for an even more polished, yet antique finish. By now, I'm sure you have heard that Stampin' Up! has reorganized the color families, bringing back several favorite In Colors and adding just a few other new colors. I'm pleased to have River Rock and Baja Breeze back especially. I like the new colors, but will know more when I get the real cardstock in my hands. I'm still disappointed that there is no lavendar or medium purple at all. Also there is really no true medium blue. I do think trimming down the number of colors has made sense. They are offering some make-up packs of things like watercolor crayons and markers to get the new colors without having to buy complete sets that include colors you already have. What I don't get is the pricing. The 17 new watercolor crayons are $40 whereas a set of 10 (one of the color families) is only $16. This makes no sense. Speaking of pricing, cardstock went up quite a lot. However, as far as I can tell that is the only thing that increased in price. I think that is remarkable so I won't complain about the cost of paper. Stamp sets are always a matter of preference. I found a few I wanted, not loads, but some. There are quite a few of the past and current mini catalog sets in this annual catalog. I'm glad to see one I wnated from the mini available all year. Gives me a lot more time since I'll be spending money initially on new inks and papers. All the new sets are available in wood and unmounted. I had hoped they would go back and make at least some of the more expensive wood sets available in unmounted to but so far they haven't. LOVE all the Level 1 hostess sets!!! I hated all of them last year so I'm delighted to have so many to choose from when it is my turn to be club hostess. The catalog has a lot of organizational and reference changes that add great value. There are markings around stamps that have a coordinating punch, plus the punches are listed with the set. There's a table about what adhesives work with what type of media. 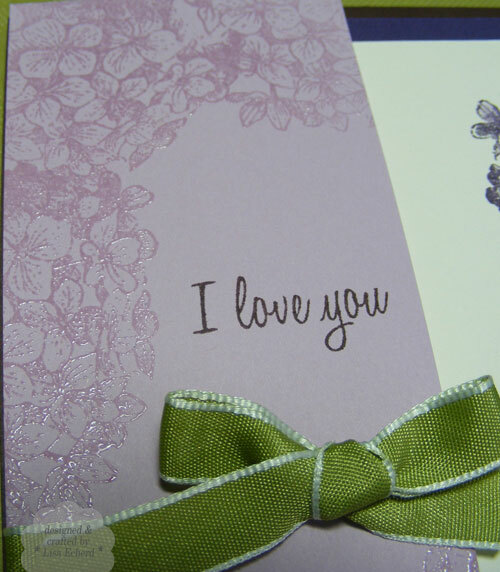 You can see what ribbons and accessories come with a color just like you can the inks and paper. The tone-on-tone designer paper is now in packs by color family and has a couple of new patterns but far fewer patterns total. Not sure how I feel about this yet. Really like the patterns in the hostess Level 1 paper pad which is In Colors this year. If a color comes in ribbon, it comes in all the ribbons. But this still leaves a ton of colors that have no coordinating ribbon. For example, in the Regals, only Night of Navy has ribbon. Lots of great embellishment options - you can buy pearls and rhinestones separately as well as flowers. That is nice. And I love, love those new Antique brads. Those will be at the top of my list for July order. The designer buttons have more buttons per pack and coordinate by color family. I'm pretty pleased and look forward to July when we can order. 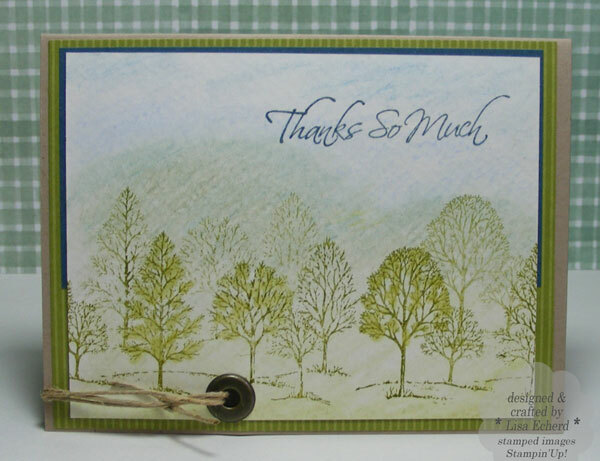 I wanted to send a thank you note to some folks who live in our beautiful blue ridge mountains which are actually very green right now particularly with all the snow and rain eariler in the year. 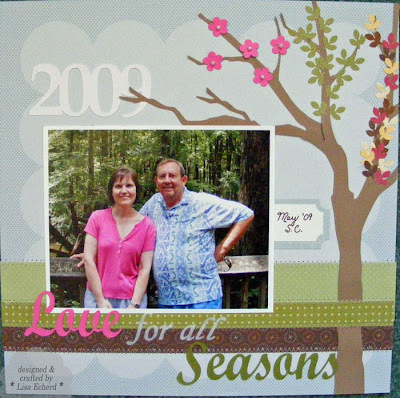 Lovely as a Tree was my first Stampin' Up! set. Apparently it has been around for ages and it is easy to see why. You can do so many things with this set. This stamp in particular is my favorite. For the background, I colored watercolor paper with watercolor crayons in various shades of greens and blues to look slightly like an outline of a mountain range. I overlapped the colors a lot; then I went over the entire thing with a blender pen. The image is stamped twice to get the entire area covered. 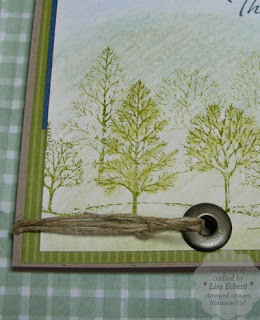 Then I stamped off for trees in the background. I went over a few trees with the blender pen dipped in old olive watercolor crayon. The left edge has a slight bite out of it using a hole punch to keep the twine from sliding off. This card makes me feel cool - a nice thing on yet another 90+ degree day here in the foothills. Hope you find a cool spot wherever you are. Just about out of time... Here's my card for the latest Reader Color Inspiration at KWernerdesign.com There are lots of bright colors from the photo. I used my latest Cricut cartridge, Storybook, that I snagged for a very low closeout price at Walmart this weekend so this one was a bit of an experiment in using just cardstock and some new images for me. Better post. Thanks for stopping by! When I was a teenager, I would read long novels very slowly over long summer days. I liked to get to know my characters. I got quite an education as an adolescent reading Judy Blume and even more of one later on reading Judith Krantz - although I'm not sure it was the education my Mother was expecting when she hauled me to the library. I still love to savor the enjoyment of engaging with charcters a little at a time over a few days. This is why I much prefer to read or watch a drama than watch a movie. Also, I want the details. My work and hobbies are all about the details so why not my entertainment, too. You get out of something what you put into it. My husband has gotten into the classics. Try as I might, I just can't read classic literature. I want to read about today's people. I read to learn, to escape, to enjoy. I like romance but with an edge. Like my chocolate, I don't want it too sweet. Neither do I want my adventure too gory. High body counts turn me off. Mary Kay Andrews - anything and everything she has written is fun, good Southern writing. Hissy Fit is my favorite. David Baldacci - I like the Camel Club series and a recent novel True Blue I just finished. But his best work is still his first - Absolute Power. The Lottery Winner is another pick. Susan Elizabeth Phillips - the best in beach reads - funny, smart, romantic. Best to start with her earlier books as she often connects the characters from earlier novels into more recent ones. Katie Fforde - This is a new author to me but apparently a prolific one. I just want to crawl into her novels and live in these current English settings. Jude Devereaux - books set in the present day. I'm not into historical stuff especially time travel thing - although the Summerhouse was pretty good. Sandra Brown - I prefer her thrillers to her romance novels - Envy, Charade. The only one I really hated was Smoke Screen. Jane Green - all of her books have been very enjoyable reads - particularly Jemima J. If you've ever felt the need to lose weight to fit in, it is a must read. Jennifer Chiaverini - I'm reading the Aloha Quilt now. 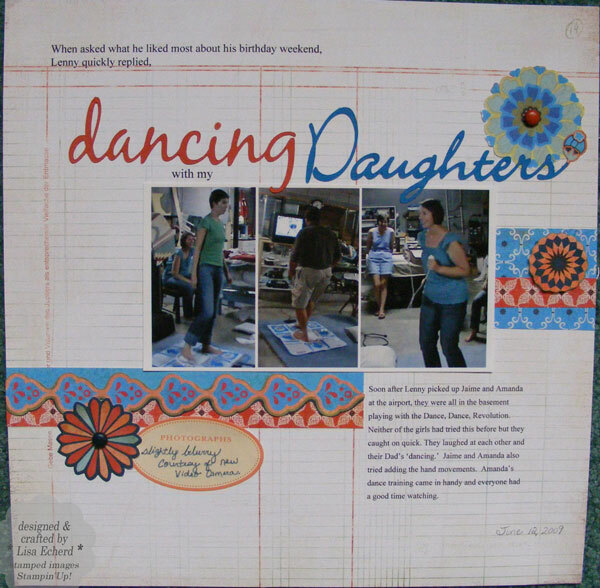 She is a must read for quilters and anyone else who wants a good clean family story. Start with her first novel. Fannie Flagg - one of my favs of all time is "Can't Wait to Get to Heaven." I read it twice and and tempted to read it again that is really rare for me. Sidney Sheldon - He has passed away now but what a great storyteller. His books were some of those I read when I was a teenager. Sophie Kinsella - Twenties Girl and Undomestic Goddess are very funny and engaging. I can't get into the shopaholic stuff. Sarah Strohmeyer (I think I'm spelling that right) - Cinderalla Pact, Sleeping Beauty Proposal. Judith Krantz - will probably always be my favorite author. I've read Scruples at least three times plus everything else she has ever written including her autobiograpy. 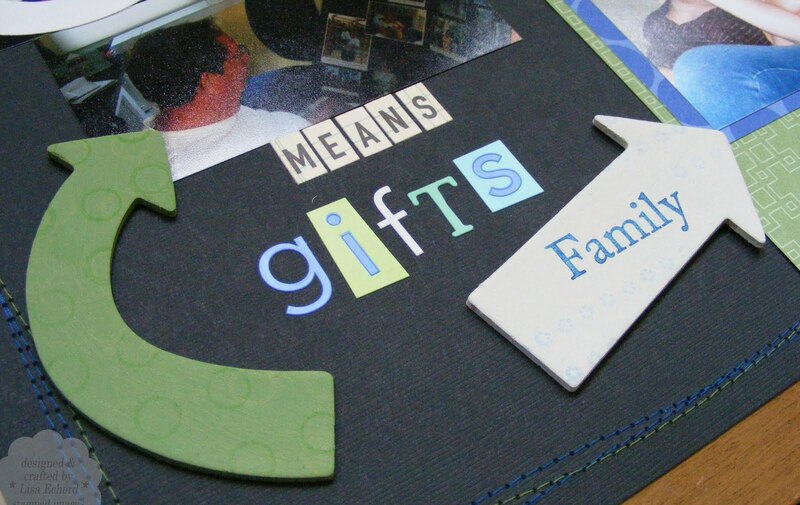 So often I hear people say they want to scrapbook but they don't have time, don't know where to start, etc. 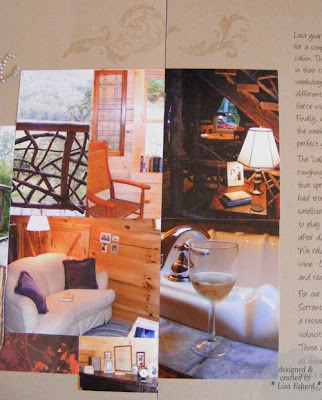 One of the best ways to corral your photos is a photo collage. A lot of photos don't need to be printed at a full 4" x 6" to tell the story. You can crop and arrange already printed photos on a piece of cardstock. Or, you can create and print your own photo collage. I do this a lot. I'd just completed the layout above when I saw an article about photo collages in this month's BH&G Scrapbooks Etc. magazine. Check out the Digifusion article in the August issue for more info. Using the Organizer in Photoshop Elements, I select the photos I want to collage and right click on them. Choose Go to Full Edit. In the Editor, create a blank file (Ctrl + N) resolution 200. Size the same as the paper to be printed on. For the one above I chose 8 1/2 x 11 because that was my paper size even though my collage was smaller. Go to the first photo to be cropped. Choose the Crop tool. Specify a resolution of 200 and then specify the width and height of the desired image. The images above were cropped to 2 3/4" x 2 3/4." Crop all the photos. Your specifications for the crop tool will stay in place until you change them. Drag each photo on the blank file. Arrange as desired. Usually I leave a little space in between the photos. Sometimes I leave it blank so the space will end up white. Sometimes I draw in a rectangle behind the photo collage and color it black or whatever color I want to border the photos. For the one above, I created a beige rectangle so I didn't have that stark white background. Then just print the collage. Usually, I do not save the cropped photos as separate files. Once the collage is printed, you only need a title, journaling and a few embellishments. It is a great way to keep the focus on the photos + get it done! 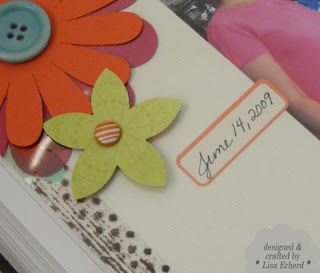 When I was flipping through the BH&G Scrapbooks Etc a few days ago, I did get this great idea for embellishment. Trace around a plain chipboard element with a pen or marker. I also added some stamped images and a brad. 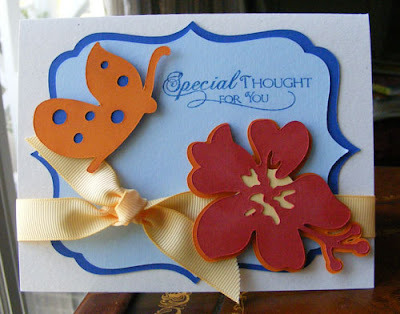 The flower is cut with Accent Essentials Cricut cartridge. 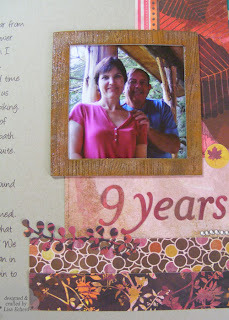 I used just a couple of the layers and backed it with some Close to Cocoa cardstock. Cardstock: Certainly Celery for background, Close to Cocoa by SU! Every since I got my Cricut last October, I've had my eye on the Cricut Storybook cartridge. I've watched countless E-bay auctions and it always went a little too high for me. Although a font cartridge, Storybook has a ton of great image designs for cards and scrapbooking. Yesterday, I lucked out at Wal-mart finding this great cartridge for $23! I'd read on one of the discussion boards a couple weeks back that some Wal-mart stores were closing out their craft departments. I don't know if this is true but there were a lot of things marked down. Initially I stopped by for my favorite adhesive and it was already cleared out. I hope they are just changing some of their stock and not closing out craftts altogether. It is 15 miles from my house the the nearest craft store otherwise. The new cartridge didn't gather any dust in my craft room. I'd already started this card before I went to town and I used Storybook to cut the scallop circle design from Stampin' Up! designer paper. The card is for the Finally Friday challenge at Two Peas in a Bucket to use black, white and one other color for punch. One project note: The main part of of the card is attached with foam adhesive. I tucked the ribbon under the edges of the raised are with glue dots to create the folds. 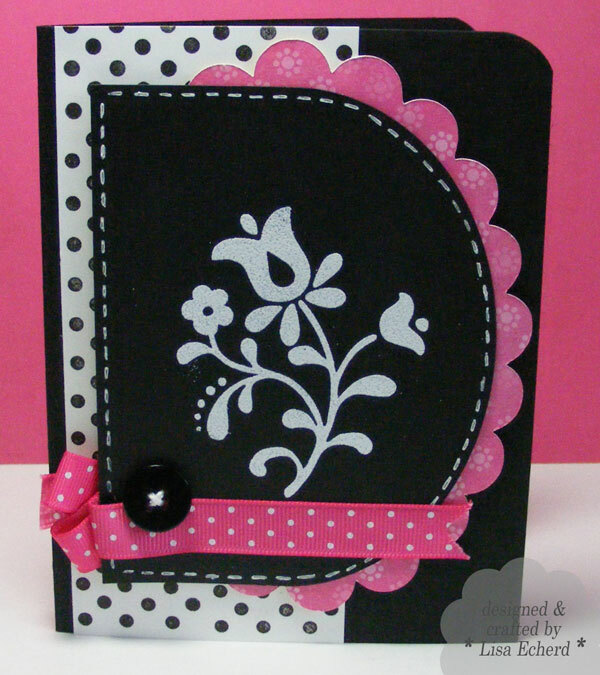 Cardstock: Black and Whisper White by SU! Embossing Powder: White by SU! Ribbon and DSP: Melon Mambo by SU! Wishing all Father's a happy day! Mine is a gem who is there in every season for me and my Mother. The leaves and snowflakes are embossed. The sky for each season is colored with varying colors of blue and purple pastels. Rub-on's came to the rescue since I have only one Father's Day stamp and the text was too large for this card. Using the flat side of the button makes it easier to apply a rub-on. Ingredients: Stamps: Season of Friendship by SU! Ink: Chesnut Roan fluid chalk; Bravo Burgandy, More Mustard, Really Rust, Certainly Celery, Old Olive, Rose Red, Whisper White, Ballet Blue craft inks by SU! 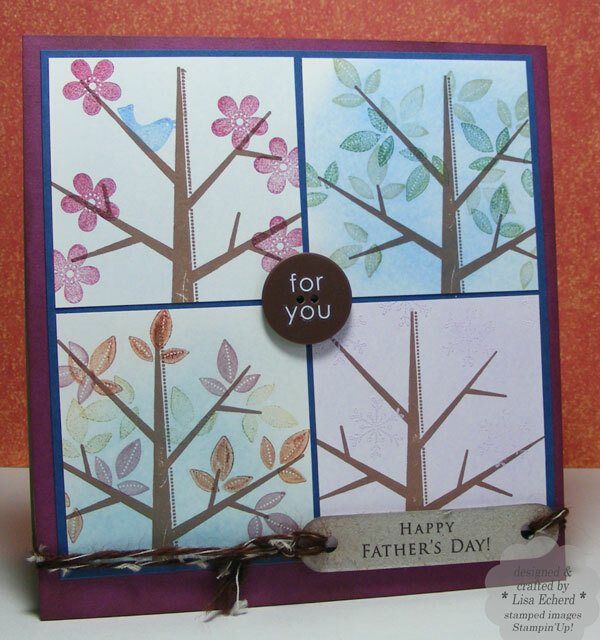 Rub-on's: Father's Day greeting from Chit Chat by SU! Cardstock: Enchanted Evening by PTI; Rich Razzleberry by SU! I'm so, so bad at procrastinating on photos. I see a great photo op and think, I'll get that later. 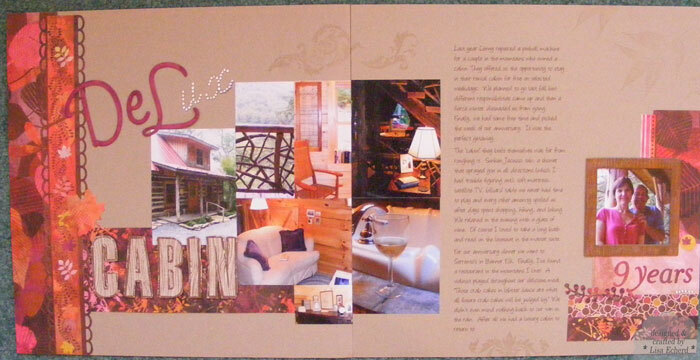 The last few days we have been staying in Valle Crucis in the North Carolina mountains. As we frequently drove through the lush, picturesque valley, there was a particular barn I wanted to photograph. Horses would graze near the barn that was adorned with a large painting of a sawtooth star quilt. One day, I saw it and thought I ought to stop and take a photo. But, like Scarlett, I thought I'll do that tomorrow. When tomorrow came, I had to go out of our way to go by the barn and there was the barn, the horses and a horse trailer - parked right in front of the painted quilt. It totally ruined my perfect photo! I have no one but myself to blame. Do you ever pass up the perfect photo thinking you'll get to it next trip? 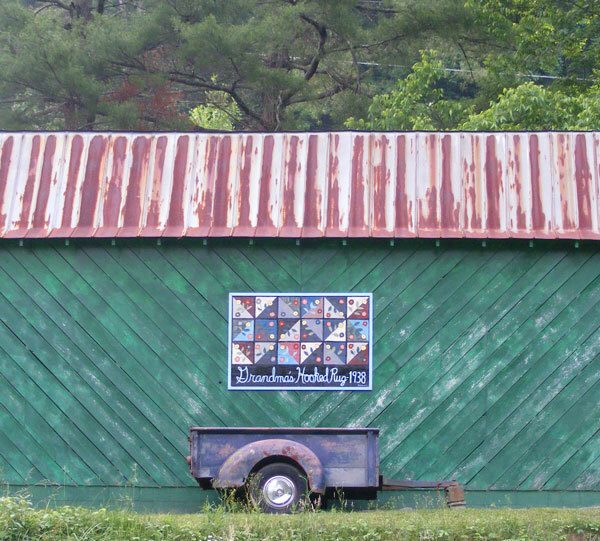 I did get this photo of another barn with a painted version of a hooked rug. Cool, right? If you want to vacation, check out the rentals at http://www.blueridgerentals.com/ We stayed in 2's Company which is what I would call a deluxe moutain cabin - sunken jacuzzi tub, hot tub, pool table, gas grill, satellite TV, every ammenity. Hiking, biking, beautiful scenery and a marvelous anniversary dinner at Sorrento's in Banner Elk. Below was my favorite spot in the cabin - a super soft loveseat upstairs under a skylight. I curled up and read a sweet novel called Practically Perfect by Katie Fford - no phone, no e-mail, no cooking or work - heaven! It was just a delightful trip! You know that old game - Rock, Paper, Scissors? Scissors cut paper. True, but paper can defeat scissors. Just use a good pair of scissors on paper for awhile and then try to cut fabric with them. I couldn't find my fabric scissors when making the card below and using my paper scissors I had trouble even cutting that little bit of orange ribbon! 1. Stampin' Up! 's Paper trimmers (about $10) - fabulous for cutting paper. 3. a pair of fabric scissors. Never use your good fabric scissors (or even not so great ones) for paper. Paper dulls scissors. The real tip for the day is that you have to preach this to anyone who might "borrow" your scissors. Lenny knows that my many pairs of fabric scissors are absolutely off limits. For his convenience and mine, there are always some older non-fabric scissors lying around. I usually mark those with a "U" (Utility) on the handle with a Sharpie. This card was for my husband's birthday. We joke that he and our cat, Jasper, have perfect lives. The dimensions of the card unfolded are 12" wide by 4 1/2" high. I scored the sections every 3 inches for folding. 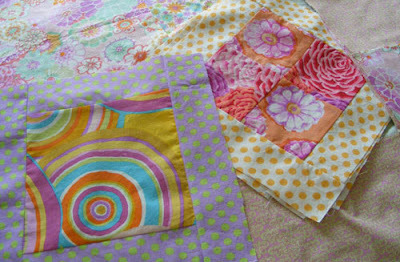 When adding layers that go over a fold, do one section at a time folding as you go to prevent puckering. The rainbow of hearts was created with one heart stamp. 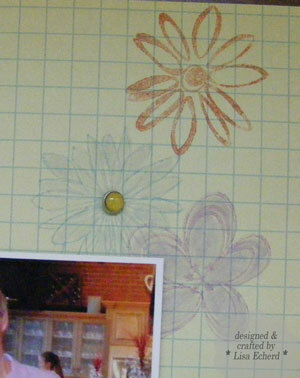 I marked an arch with a pencil using my CM circle cutter as a template, then erased it after stamping. 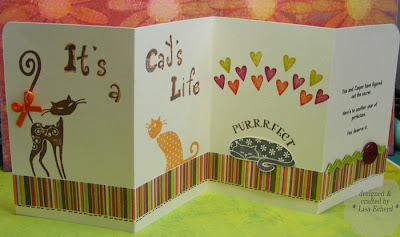 Ingredients: Stamps: Cats by Inkadinkado; heart is from Cheep Talk by SU! Ink: Chesnut Roan and Amber Fluid Chalk inks; Basic Gray, Purely Pomegranite, Kiwi Kiss, Dusty Durango from SU! I presented Lenny with our 2009 album this weekend. We looked through all the pages together and laughed at some of the funny little things that happened. One of the greatest joys of scrapbooking is you see a photo or read some journaling and laugh at something you otherwise might have forgotten forever. This layout is the title page. I organized the book into three sections: Little stuff around the house, Travel, and Family Time. The first section was chronological. 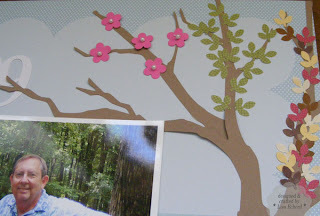 The tree above has limbs for winter, spring with the flowering trees, summer and autumn. I'm not sure what season of our lives we are in, doesn't matter. They are all good. 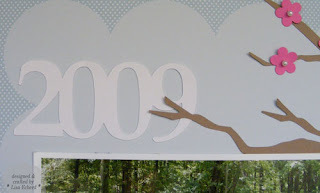 I cut the tree with the Cricut and SCAL software. I already had a tree I'd imported before and to keep from having to redo it, I copied, resized and paper pieced a little of it. Some of the piecing is hidden behind the green strip on the bottom. The notches in the date tag are made with a circle punch. I love that background paper from Stampin' Up! The built in scallop design kind of looks like clouds. I guess the color is supposed to be a light turquoise but it looks like Baja. Do you think perhaps someone knew Baja Breeze would be coming back when they designed the Sweet Pea pack? Whatever, I love that color! 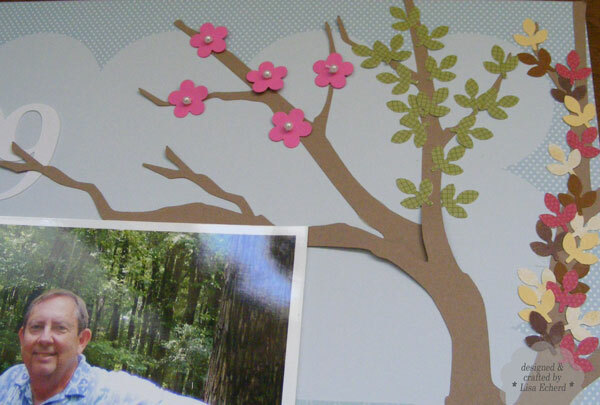 Punching out all those little leaves is much easier from DSP rather than cardstock. Now that 2009 is done, I can get back to 2010. I think I'm up to the wedding and May which is really good for me. Thanks for visiting! 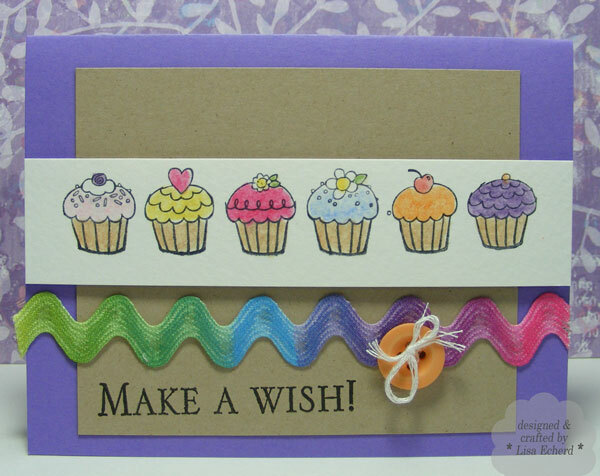 Ingredients: DSP: Sweet Pea and a few others by by Stampin' Up! I found myself with a little waiting time a couple of weeks ago which made it a good time to watercolor. This time I did pick out some ribbon to match my colors to which is much easier than trying to find ribbons to match after coloring. I think this ric rac came from Walmart a long time ago. They used to have great ribbons at our local stores but now only one store in the area has any by-the-yard fabrics and ribbons at all. This card will go in my next Operation Write Home box. To learn more about Operation Write Home, visit them at http://www.operationwritehome.org/ It is a wonderful way to share your love of cardmaking. Ink: Black Stazon, various watercolor crayons by Stampin' Up! Paper: watercolor paper, Kraft by SU! In 2009 we attending a going away party for dear friends who were moving across the country. It is not 'goodbye' but 'til we meet again.' We are going to visit them later this year and can't wait to see them! 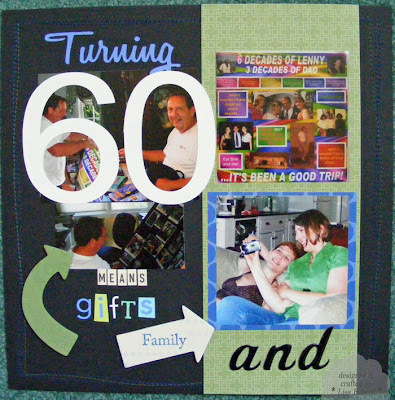 To keep with a nostalgic theme, I took scraps of various designer papers and cut into 2 inch squares. I adhered with one piece of adhesive in the center of each to a strip of scrap cardstock and zig zagged around the edges. I had some of the pieces hang off he edge so it would look more like a running piece that had been trimmed down. To make some of the stamped flowers show up more on the light green grid paper, I watercolored in the centers. And now, I'd better get to work so I can earn a little money for our trip :-) And there enters that pesky real world stuff again. Oh, well! 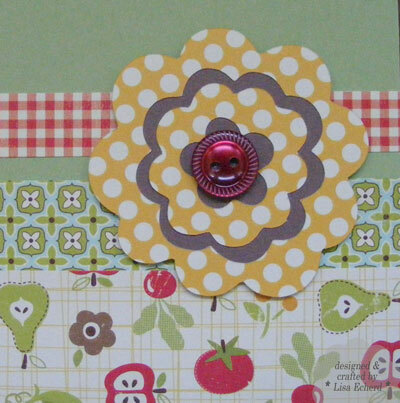 Cardstock: Rich Razzleberry by SU! This is my second go at the sketch challenge for this week at Splitcoaststampers. I have to say, I'm still not in love with it although it does look better to me this morning than it did at 9:30 last night :-) I did turn the oval on it's side so maybe that is part of the issue. However, I do love the color combo of Turquoise, Ruby Red and Cameo Coral. The last two are being retired. Ruby Red so often matches DSP from other companies I'm sad to see it leave. And I've always loved Cameo Coral though strangely I don't use it that often. Fortunately, Papertrey Ink has a similar color. Instead of layering the oval on top, I cut it out of the Cameo Coral cardstock and used dimensionals to raise the cardtstock layer above the stamped Whisper White image. The dessert option was ric rac. This one came from a grab bag at Hobby Lobby. They have those in the fabric department and you usually get lots of useful ribbon. The Reader's Choice Color Inspiration #3 challenge is posted at http://www.kwernerdesign.com/ . The colors this week ironically focus again on purples. I say "ironically" because this is just when Stampin' Up! is pulling every lavendar and medium purple shade from their line-up. Lots of people are purple people. Many little girls, including our Nai Nai, love purple! So for now, we can celebrate it! My blue hydrangeas are in full bloom so this seemed like a good stamp to go with. 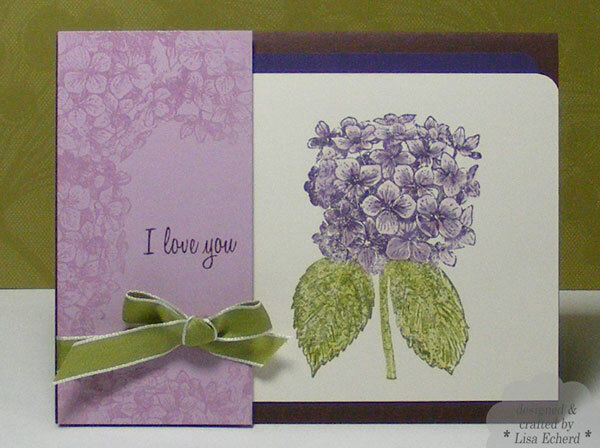 I used markers to color the top half of this stamp in darker purple and the bottom in Old Olive. Then I filled in the blanks with Pale Plum marker and watercolor pencil and Certainly Celery watercolor crayon on the leaves. This was the first rubber stamp I ever bought and having markers and watercolor crayons have given it new life and added dimension. 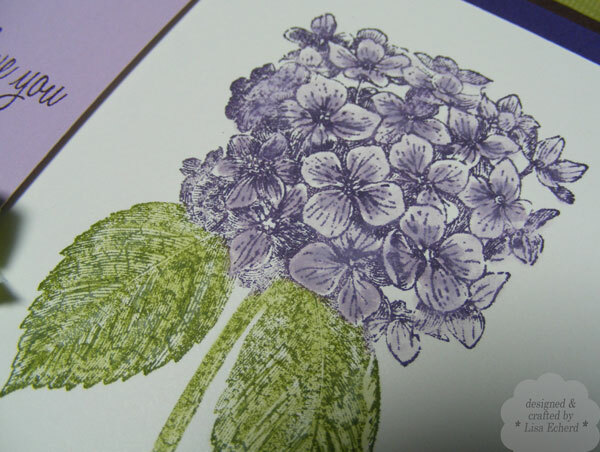 Just the top half of the stamp created my tone-on-tone pale plum paper. I stamped in Versamark and embossed with clear powder. I always put a glue dot or two behind my bows so they don't come untied. Ribbon: Old Olive Taffeta by SU! Have you noticed how some stickers are really sticky and some aren't? With some stickers, where you put them is where they stay regardless of whether you are happy with the placement. With others, you can move them around, even put them back on their original sheet to use on another project if you change your mind. Recently, I bought some October Afternoon label stickers from the Cherry Hill collection which are very versatile. But of course the first one I used, I got it a little crooked and wanted to reposition. Uh-uh! That sticker was stuck - crooked or not. So I made a note on the remaining sheet of stickers that says "Super Sticky." Then I'll know these are not repositionable. Other stickers might get a note that says "Repositionable" or something that helps me know how careful I have to be in adhering them. When I decided to add a date to the layout above, I again went to the versatile October Afternoon stickers. I noticed my note and paid extra attention to how I positioned the sticker the first time - because I knew this "Super Sticky" one wouldn't give me a second chance. 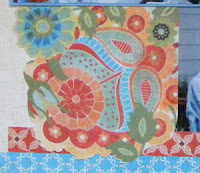 I had already taken a bite out of this transparency by cutting away a corner to use on another project. I covered up by cutting large flowers from some SU! cardstock. Happy Tuesday, thanks for visiting! 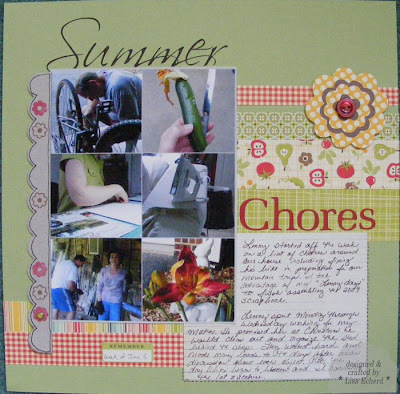 Ingredients: DSP and journaling card: Transparency by Fancy Pants from the Delight collection. 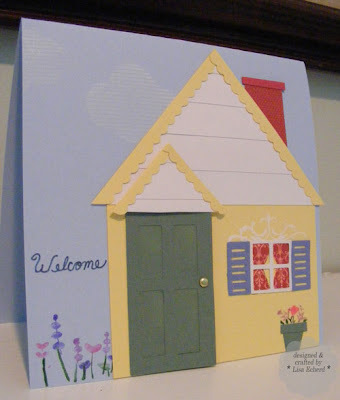 A friend recently moved into a new home and I sent this little welcome card. Actually, it wasn't so little. It ended up as a 6x6" card to fit in the details. I had fun making the window, shutters and door with the Cricut and then cutting the other items with my paper trimmer and decorative scissors. 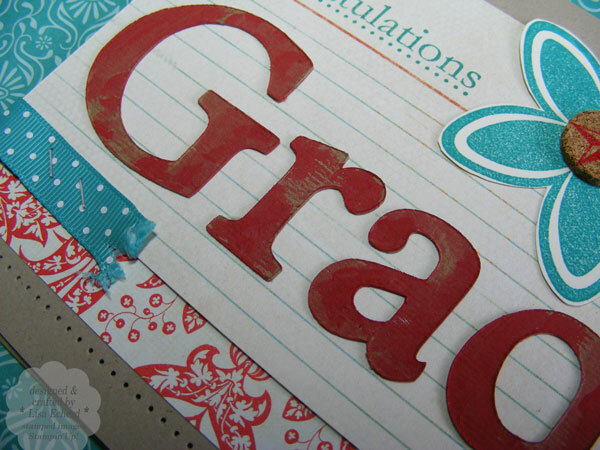 I used her favorite Stampin' Up! designer paper for the draperies and the chimney. There are stamped clouds near the roof line but they didn't show up very well. I stamped in just Whisper White - probably should have embossed them. I've had this card idea rolling around in my head for awhile but hadn't gotten it together until last week. She was delighted with the card and I hope she will be very happy in her new home! Cardstock: Brocade Blue, Bashful Blue by SU! ; Lemon Tart by PTI! DSP: Raspberry Tart by SU! This weekend, I'm busy trying to wrap up the 2009 album. I thought I only lacked the title page but just realized I miscounted the pages and will need one more to make the spreads work out. Ugh! So close... 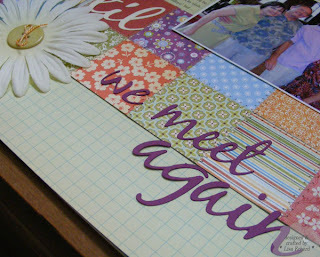 I love to scrapbook but when I get close to being finished with a project, I'm always anxious to get it done. Of course there are some photos that I had not worked with so I'm sure I can work out one more page. The page above is the last of the "Party" pages from last year's birthday party. Actually it is the first as it precedes "Party" in the book. Scrapbooking is supposed to be about doing what you like and not really having to follow 'the rules.' Yet, there are guidelines, sort of, and one of those is not to use more than 3 fonts per page. That was always the rule in Power Point presentations, too, so it must be a general copy editing rule or a carryover to the world of scrapbooking. Anyway, I smashed it to pieces with this layout - with 6 fonts! There really isn't any journaling in this introductory page so I just used lots of stickers, some die cuts and one stamp to get my message accross. The 3 rows of stitching around the edge help unify the busy layout. I cut Turning with the Cricut and SCAL software. Many fonts cut better if you use the Shadow option as it makes the letters a little thicker and less likely to bend or tear when removed from the cutting mat. Finally I used some new puffy stickers from American Crafts for "and." It was my first experience with these. I really liked the look and dimension. Ingredients: Stamps: Polka Dot Basics by PTI; Make it Count by SU! Ink: Brilliant Blue by SU! DSP: Jersey Shore by SU! Stickers: Ledger stickers by October Afternoon; "and" Blackberry puffy stickers by American Crafts; the rest are old and I don't know where they came from. It's supposed to hit 90 degrees this weekend. All the snow we had this winter seems like a distant memory as we are going out early to do our gardening and beat the heat. This layout is from the one snow we had in 2009. 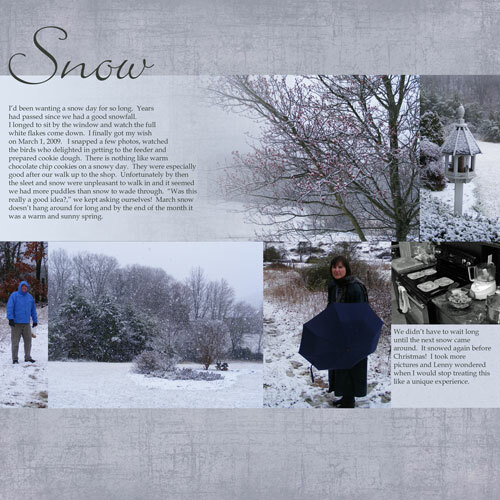 It had been years since we had a snow day so I took lots of photos, made cookies, and walked in the snow. Most of this page is a digital layout as shown here. 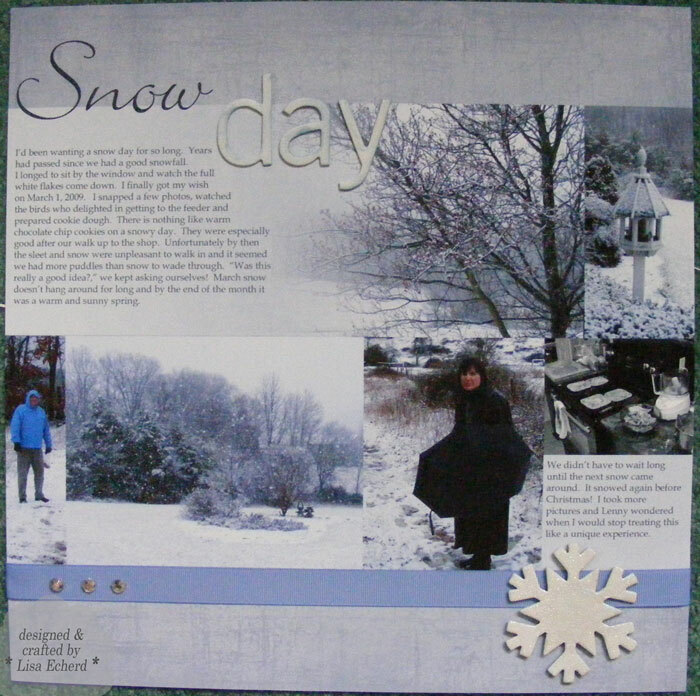 I just added the ribbon, some chipboard letters and the snowflake. The background paper was actually a red color. It was changed in Photoshop Elements with the Hue/Saturation option before adding to the layout. I usually have the photos open so I can match the background paper to the photos as much as possible. 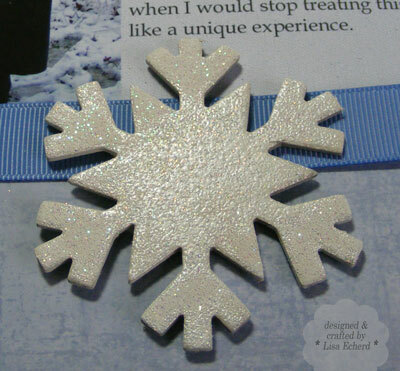 The snowflake was painted white. Then I sponged it with Whisper White craft ink and embossed with glittery embossing powder. Doing this as a part digi page really worked out great since I'd never been able to find the right background paper for these photos. Ribbon: Brocade Blue by SU! 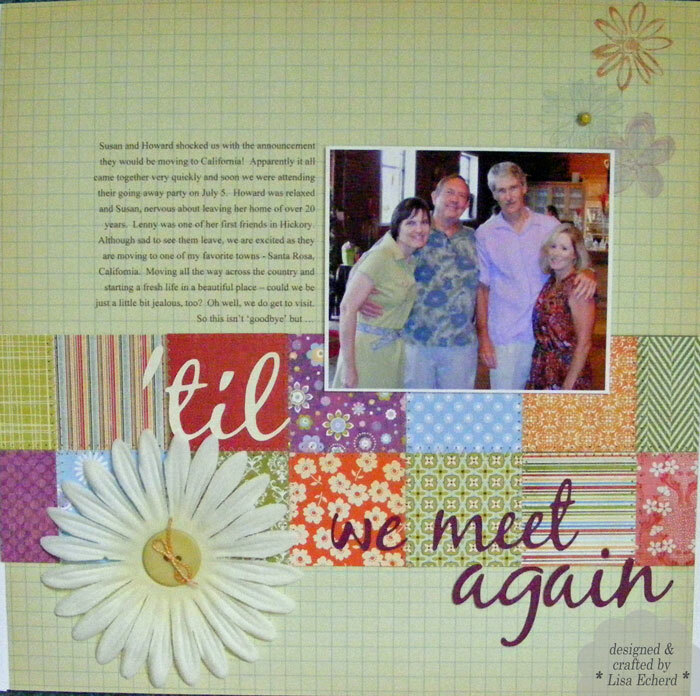 BH&G Scrapbooks Etc. for June has some great card sketches. This one really shows off designer paper. It was a good fit for the Basic Grey Offbeat collection because of the matching chipboard. As promised by PeachyCheap where I bought it, there are about a "gazillion" little letters - wonderful for cards. 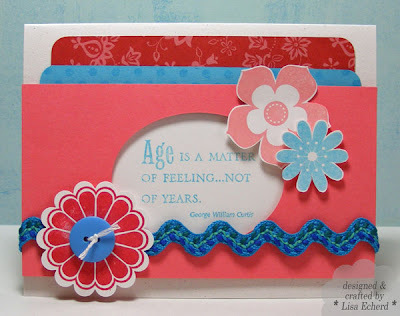 It's been awhile since I challenged myself to use pre-cut chipboard on a card. 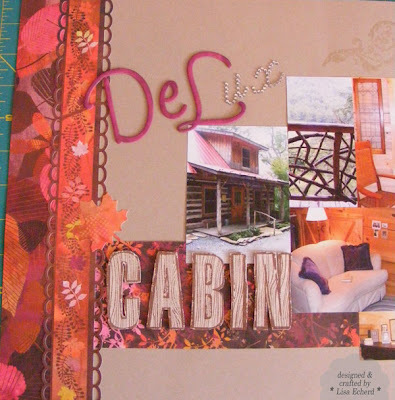 The version in the magazine featured some real sewing but I did faux stitching with a journaling pen. 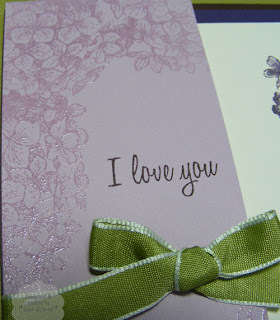 Chipboard heart by Stampin' Up! Pen: Brown journaling marker by SU! Finally! I'm getting my card made and posted for last week's Splitcoast stampers challenges. This is for the color challenge to use Real Red, Bermuda Bay and Kraft along with ledger paper for dessert. Also, Thursday's ways to use it was about using paint. 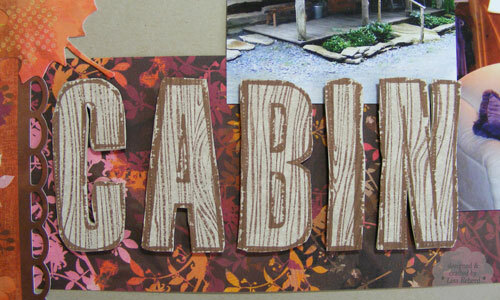 I love to paint chipboard so I cut these letters out of lightweight chipboard with my Cricut and coarsely painted them. The card is 5 1/2" square. Letters: Plantin Schoolbook cartridge, Shadow letters 2". For the chipboard, I use 6 depth and maximum pressure settings. I painted most of the letters with a light coat of acrylic red paint then dabbed a bit more on in places. The chipboard had a little texture to it which helped the effect. 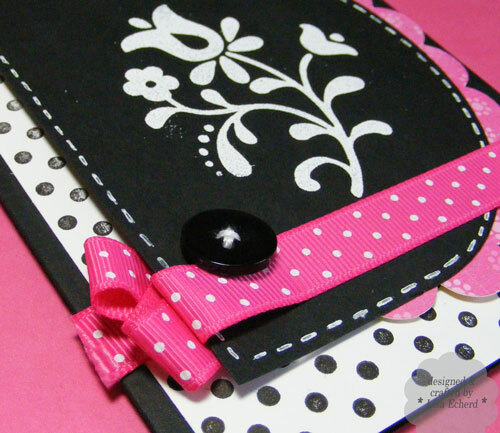 The ribbon is stapled with the Tiny Attacher by Tim Holtz. I've had this for just a few weeks and know why now everyone raves about it. Perfect size for cards. This card goes to Megan who graduates from high school in a few days. I remember when she was born! It really doesn't seem like 18 years ago! When you start getting invited to your friends children's graduations, you have apparently hit one of those 'age' moments in life. Those seem to be coming along more frequently. Yesterday, I was shopping for a dress to wear to a cousin's wedding (I made her Christening gown when I was in college!) and didn't like what I saw in the mirror. When did my body start changing like that??? Am I having my mid-life crisis? Do I get to buy a convertible now? There has to be an up side. 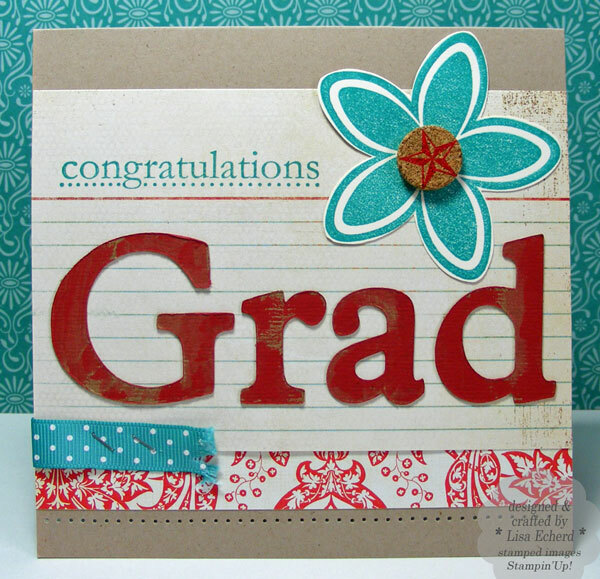 Ingredients: Stamps: Office Accruement, Congrats by Stampin' Up! Ribbon: Bermuda Bay by SU! What do you do with a gorgeous piece of designer paper like this one? It looks too pretty to cut - and it is often too busy to use effectively as a background. The answer is actually cutting it up - and not just a gentle trim either! 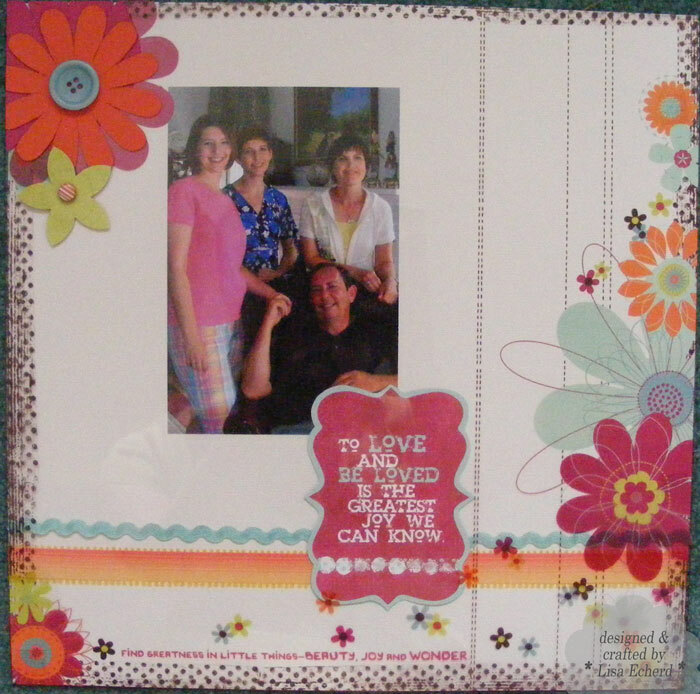 Cut out the designs for a great effect whether you are making cards or scrapbook pages. These two pages were both embellished using some of the above Basic Grey paper from the Marakesh collection. I've still got lots of great designs left on the one sheet of this paper I had. First I cut out a portion of the design in a square and then trimmed around the edges of some of the flowers. Then I started cutting out individual flowers for embellishements. A few strips of other papers and a couple of stickers and the pages were done. 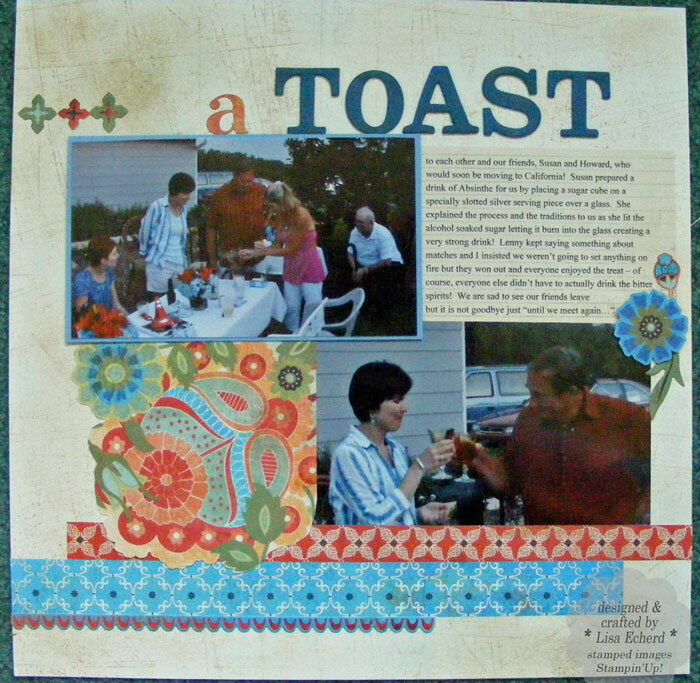 The background paper for "a Toast" started as plain white cardstock. Stampin' Up! 's Sanded stamp and some Ranger distress ink really made it fit in with the DSP background for the other page. "TOAST" started as undressed chipboard. I had trouble matching the paint color getting my first effort too green, so I went over it with paint that was too blue. A little of this, a little of that and it was just right. Don't you just love the distressed look? Nothing has to match perfectly. So don't hoard your paper, cut it up and make something even more beautiful. Thanks for stopping by this Tuesday! Ingredients: Stamps: Sanded, Itty Bitty Backgrounds by SU! Ink: Ranger Antique Linen; Groovy Guava by SU!